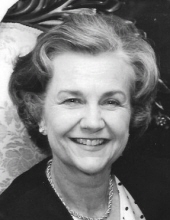 Frances Martin Shackelford Leavitt, widow of the late Brooks Russell Leavitt, died on Saturday, March 23, 2019 at her residence at King’s Grant in Martinsville, Virginia. She is survived by one daughter, Frances Leavitt Lee and husband Ken of Hillsborough, North Carolina, and by two sons, Brooks Russell Leavitt and wife Priscilla of Chapel Hill, and Dana Hastings Leavitt and wife Anna Lee, of Pendleton, South Carolina, four grandsons, Brooks Spencer Lee of Carrboro, North Carolina, Joseph Harrison Lee of Waco, Texas, and Brooks Thomas Leavitt and Lee Howard Leavitt of Pendleton, and a granddaughter, Alden Hale Leavitt of Greenville, South Carolina. She is also survived by two sisters, Mrs. Bate C. Toms, Jr. of Martinsville, Virginia and Mrs. Mary Mumford of Dedham, Massachusetts, and a number of nieces and nephews. Mrs. Leavitt was predeceased by husband, Brooks Russell Leavitt of Martinsville, VA; son, Spencer Shackelford Leavitt of Pendleton, and sister, Mrs. Robert H. Chapman, of Spartanburg, South Carolina. Mrs. Leavitt was born February 8, 1926, the daughter of the late Dr. John Armstrong Shackelford and Mrs. Margaret Spencer Shackelford of Martinsville and Spencer, Virginia. She was the granddaughter of Dr. Jesse Martin Shackelford (founder of the Shackelford Hospital) and Fannie Armstrong Shackelford. Mrs. Leavitt spent most her life as a resident of Martinsville. She was the devoted Mother and loyal friend to many. Mrs. Leavitt was a lifelong and active member of the First Presbyterian Church of Martinsville, where she served as an Elder and as Chairman of the 125th Anniversary of the church held in 1979. She was also a past President and member of the Martinsville Garden Club, and a former member of the Charity League. She was also a member and past President of the Martinsville Literary Club, and a former board member of the Blue Ridge Regional Library and the Piedmont Arts Association of Martinsville and Henry County. Mrs. Leavitt was also a member of the National Society of Colonial Dames in the Commonwealth of Virginia. Mrs. Leavitt was a graduate of Martinsville High School and attended Saint Mary’s School in Raleigh, North Carolina, the University of North Carolina at Chapel Hill, Holton Arms School in Washington, DC and Mills College in Oakland, California. Services will be conducted at the First Presbyterian Church, Martinsville, VA at 10:30 a.m. on Thursday, March 28, 2019 with Reverend Mark S. Hinchcliff officiating. Interment will be in Oakwood Cemetery in Martinsville, VA at 1:00 p.m. also on Thursday, March 28, 2019. In lieu of flowers, Mrs. Leavitt suggested contributions be made to the Salvation Army, P.O. Box 551, Martinsville, VA 24112, or the First Presbyterian Church of Martinsville, Virginia, 1901 Patrick Henry Avenue, Martinsville, VA 24112. The Leavitt family is under the care of Norris Funeral Services and Crematory of Martinsville, VA. Online condolences may be made at www.norrisfuneral.com. To send flowers or a remembrance gift to the family of Frances Martin Shackelford Leavitt, please visit our Tribute Store. "Email Address" would like to share the life celebration of Frances Martin Shackelford Leavitt. Click on the "link" to go to share a favorite memory or leave a condolence message for the family.